Can public libraries sell or capture the rights of the public? On 12 May 2011, I participated in the Law and Access to Culture in the Information Society conference organized by Fundació Antoni Tàpies in Barcelona. I spoke in a panel with Simon Bell, Head of Strategic Partnerships and Licensing of the British Library and Gloria Pérez-Salmerón, the new Head of the Biblioteca Nacional de España. We had friendly and constructive exchanges. Both speakers appeared to agree with the commitment I was inviting them to take in favour of access to knowledge and culture. Thanks to an initiative of the OpenRights group in the UK, we are now in a position to judge how far this commitment goes in the case of the British Library. 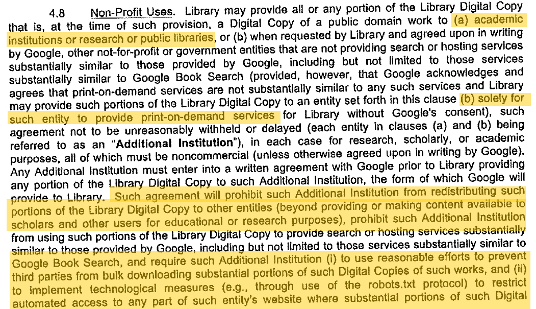 OpenRights, arguing on the basis of the Freedom of Information Act, was able to obtain a copy of the recently signed agreement between the British Library and Google on book digitizing. The text of this agreement, probably similar to many others signed by other public libraries, raises severe concerns. The British Library has accepted to sell to Google something that it clearly does not own: the rights of today’s and tomorrow’s public to access and use our public domain digital heritage. Let’s first see the actual words:1. 3. What is in the Public Domain must remain in the Public Domain. Exclusive control over Public Domain works must not be reestablished by claiming exclusive rights in technical reproductions of the works, or using technical protection measures to limit access to technical reproductions of such works. I already warned against public libraries imposing conditions and royalties on the commercial reuse of digitized public domain works. The British Library/Google agreement does much worse. Of course the alleged excuse is that it would permit more works to be digitized and made accessible. Even if it were an admissible bargain, it would be a bad one: screen streaming of text and print-on-demand are the equivalent for digital reading of television-like access for video on the Net. They lock out users from the digital empowerment that comes with possession of copies and capability to use them. Anyway, neither public libraries nor governments are entitled to enter such a bargain. The public domain in the widest sense is not public property, it is no one’s property in which all have a stake. Oh, by the way, do not lose hope: the library is only committed to “best endeavours” in preventing downloading or otherwise obtaining any portion of the Library Digital Copy”. This is certainly not going to be sufficient to prevent the public from exerting its right to share in the public domain.